Australians are great recyclers at home, but when it comes to work, we are falling down on the job. Workplaces generate over 12.5 million tonnes of waste each year in Australia, 46 per cent of which is sent to landfill. Alarmingly, the rate at which new waste is generated is increasing, compounding the problem . There is a clear need for businesses to establish recycling systems for their waste, but despite the best of intentions, workplace recycling programs sometimes flounder. Planet Ark has identified a number of key barriers to workplace recycling and some simple actions to overcome them. Four out of ten Australian workers feel that their managers are not supporting and leading pro-environmental behaviour in the workplace. Yet management level support is essential for establishing and maintaining successful recycling programs as it helps to increase awareness, motivates positive environmental performance and changes the attitudes and behaviour of staff. "A great way to get management on board is to make a business case for introducing recycling," suggests Ryan Collins, Recycling Programs Manager at Planet Ark. "For example, are you paying waste companies to pick up bins filled with un-compacted cardboard, food or plastic wrap? If so, you are paying for them to transport air. Compacting or separating materials can save you money and no boss can argue with that." Most employees don't have a direct financial interest to conserve energy and reduce waste at work like they do at home, so it's important that staff understand both how and why they are being asked to recycle. Develop a communications strategy leading up to the launch of the recycling or waste reduction program, motivate and empower staff through suggestion schemes and provide specific feedback of total materials recycled and cost savings. "Put your hand up and start the conversation," said Mr Collins. "You might find other colleagues equally keen to make a positive impact on reducing the amount of waste generated at work." The free Bin Trim program developed by the NSW EPA enables an audit of waste streams then produces a report to help specify appropriate bins. The location of and signage on recycling bins has a significant influence on recycling rates and contamination levels. Maximise participation and minimise confusion by placing clearly marked recycling bins next to every general waste bin to ensure that staff can always recycle. Place a ‘Cartridges 4 Planet Ark' bin next to the printer and bins for comingled recyclables such as drink containers in the kitchen. 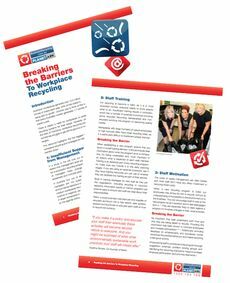 The full Breaking the Barriers to Workplace Recycling resource, free signage and a step-by-step toolkit for getting started are available on Planet Ark's BusinessRecycling.com.au website, which aims to help businesses and employees counteract the amount of waste sent to landfill and potentially save on waste costs.